Who better to fix a boo-boo than you-you? 9 doctor tools fit right inside. B.Toys also has a pretty cool quote maker. It is free to use and you can create a beautiful keepsake to share with family and friends. You put in the dialogue of a funny conversation with your child or something insightful or adorable they said. Then you pick the design and colors of your quote card and you can email or print your heartwarming keepsake:) Find the free quote maker here. What we thought: The kids loved these toys! B. Toys has a fantastic variety of great educational and fun toys for young children. The instrument set was perfect for our budding musicians. The kids really enjoyed performing concerts and forming a marching band with these cool instruments. 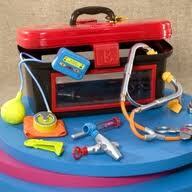 The doctor's kit had everything the kiddos needed for one of their favorite make-believe games...baby checkup. The tools could easily be used as a vet kit as well, so this one pulls double duty:) B. Toys really encourage imaginative play within children and are made to last. ABCD Diaries gives B. Toys an A+! Buy It: You can find these at Target! View the selection at B. Toys! Disclosure: ABCD Diaries was given B. Toys for review purposes only. We were in no other way compensated. The opinions expressed in this post are ours and ours alone.